Even though the weather has been good lately, I haven’t had the time to go out and photograph. I’ve been busy at work and with some other things, so the only photography-related event in the past 10 days was a small trade-show by Calumet. 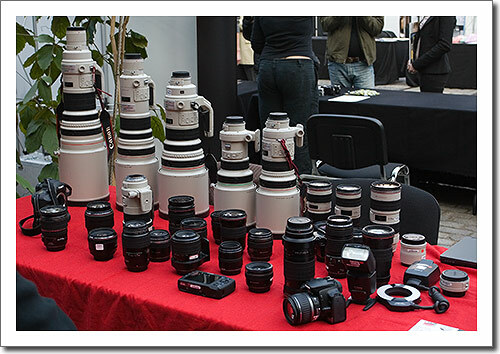 All the big ones were around: Canon, Nikon, Adobe, DxO, Wacom, Hasselblad, PhaseOne, Epson, Ilford, Hahnemühle, Fuji, etc. Canon offered a free check and clean, so I had the sensor of my 30D cleaned. Even though there was a 1Ds Mark III available, I only played with a 5D and 24-105/4 IS, a 300/2.8 IS, and a 50/1.4. Everything was very impressive, but even more impressive was a demonstration by PhaseOne and Epson. In an improvised studio a photographer took an image of a model with a 33 MP PhaseOne back, converted it to black-and-white and sent it otherwise unedited to an Epson Stylus Pro 9880. About an hour later out came a gorgeous print (about 160 cm x 110 cm) with even the tiniest details perfectly rendered and perfectly sharp.